Convenience takes a turn toward old-fashioned charm! Size: 4"H x 24" Dia. or 18" Dia. How much does it weight the Wine Barrel Lazy Susan? BEST ANSWER: An actual weight is not known. This is an exempt free shipping item, which excludes personalized items and select items shipped directly from the manufacturers. The boxed weight is 25LBS so the actual weight will be a little less than that. Can this replace a trivet—can it handle hot pans or do you still need a trivet? BEST ANSWER: The Personalized Raised Wine Barrel Lazy Susan is not designed to be a trivet. Anything placed on the Lazy Susan that is hot can stain the wood. I always still use a trivet. I wouldnt want to risk damage to the finish. I haven’t set a hot pan directly on it so it may be ok.
Is there a way to see which font will be used for the personalization initial? We are considering the letter "G". Thanks! BEST ANSWER: The font for ours is the same font that's in the picture. It was really well done and came out beautiful. We're super pleased and use it regularly. I think the only font offered is the one in the picture. but it may have changed, I got mine over a year ago. Can the writing be placed in any other location? I would like one line at the top and one of the bottom. Is this possible? BEST ANSWER: Unfortunately the engraving will always be located in this particular spot on the Raised Wine Barrel Lazy Susan. Is there any way we could increase the amount of characters per line? BEST ANSWER: Writing allows 2 lines of up to 20 characters each. The word 'Vineyards' is not automatically engraved - it is for illustrative purposes only. The amount of characters is pre determined and can not be changed. Can you pay more for more words engraved? BEST ANSWER: Hello Andrea, we do offer custom personalization depending on what you were looking to have printed. Please reach out at 800-356-8466 and our sales department will be able to assist you with any custom personalization needs. Thank you! Do I have to have something written on both lines? I only want one single name written out, not initial but nothing on second line. I do not see an option for a blank line, and it won't let me leave the second line blank. Thanks. I would like Line 1 to all be in caps and Line 2 to also be all in caps but in a smaller font. Is there a way to specify this with my order? BEST ANSWER: Unfortunately we can not offer additional customization at this time. Is it possible to put two first names on one line, if it is under the 20 letter limit? Each name would need to be capitalized. "Brent and Tawana"
BEST ANSWER: Yes, there is plenty of room. This is a beautiful piece that I have given as a gift several times and everyone has loved it! can one word be placed on the top, middle and bottom in Spanish? BEST ANSWER: I suggest you call Wine Entusiaist directly for an answer. Can the writing be in the center if it is more than one letter? BEST ANSWER: The name I submitted is centered. I would love to order this lazy Susan but I am concerned about the negative reviews.. have issues and addressed ? This lazy susan has been one of our very best we have ever offered. We have sold a tremendous amount with a very low percentage of unhappy customers. Feel free to discuss with one of our Wine Cellar Specialists @ 1-800-356-8466. What is the best way to clean this? Do I need to use Mineral Oil? BEST ANSWER: Thank you for your question, the best cleaning recommended would be a damp cloth and a non-abrasive cleaner. It looks as if there is a design under the cheese platter, if so, what is it? May we see an example with nothing on the lazy susan please? I am wanting to order this for our wedding on oct 17th. Is it possible to guarantee delivery before then to dallas, tx? BEST ANSWER: This item takes 3-4 weeks for delivery, unfortunately we cannot guarantee it to be delivered before the date you are asking to have it delivered by. Is the raised lazy susan hallow at the bottom? I'd like to place it over a smaller table top. BEST ANSWER: Yes the metal is not solid underneath. Keep in mind this product is not guaranteed to fit over a table. Does the engraving have to include the word "vineyards?" I want to buy this but just want our last name engraved on it. BEST ANSWER: Thank you for inquiry. (The word 'Vineyards' is not automatically engraved - it is for illustrative purposes only. If you have any further questions, please feel free to reach out to us directly at 800 356 8466. Thank you again. Unfortunately you can not, this item is drop shipped and gift wrapping is not an option. When personalizing, does a space count as a character? Yes, spaces do count as a character. We received a personalized wooden barrel top with a stationary metal circle affixed. It does not revolve/move. Is it missing a base piece? I was very disappointed in how off-center the lettering on this item was. It would have looked very nice had the lettering been centered as shown in the catlogue picture. This was a gift and I am extremely disapointed in how unprofessional this looks. Needless to say, I will not be purchasing anything further from this company. I was excited to buy this item and patiently waited to receive it. It arrived in 2 weeks. It was like Christmas morning for me when I found the box on my doorstep. I opened the box, then the wrapping and found it in another box with more wrapping. It was well packed to say the least. I took it out and the first thing I saw was a chip on the bottom left rim of the Lazy Susan. The chip was stained over, so this chip was visible at the factory. Yet they shipped me a defective Lazy Susan!! How inconsiderate is that? To send the customer a defective item and make the customer go thru the trouble and expense of returning it. I called customer service but they were closed for the day. I left a message for an authorization number as I want the item replaced since otherwise it is such a beautiful item. I will update this review after this issue is resolved. I trust Wine Enthisiast will step up to replace the item. I'm just so dissapointed that they would treat their customers with such disregard in sending a defective item. Producet arrived broken, stain partially on & still wet, and the lazy part didn't even turn. Then, if it ever did turn, the metal part would scrape a table top. I would never order this again. Great for my Wine-themed Dining Room! I received a gift card to WE for my 30th birthday and it didn't take long before it was burning a hole in my pocket! 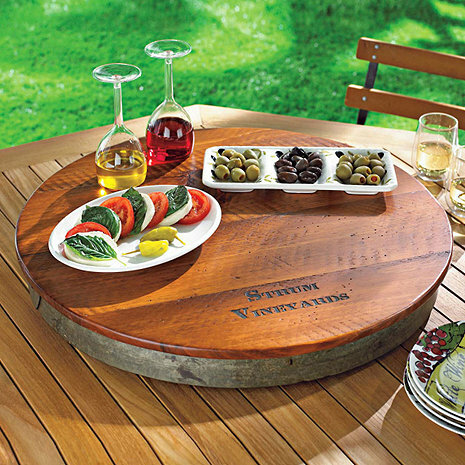 I knew immediately what I would spend it on -- the personalized wine barrel top lazy susan. My wife and I are fairly frequent entertainers and we have monthly "wine dinners" at our house. As luck would have it -- the lazy susan arrived the day of our most recent dinner (about 2 weeks before I actually was expecting it) and it was the perfect compliment to the evening -- easily allowing us to pass wines, side dishes, etc., all evening. All of our friends were admiring the craftsmanship as well as the uniqueness of the item itself. I have had this for about a week now and am very pleased with how it performs and even more pleased with how it looks in the center of my dining room table. The first thing my wife said after she gave this a couple of turns was, "Wow, this is a lot nicer than I expected it to be." I agree... very nice quality and workmanship. Would definitely recommend. This Lazy Susan is absolutely beautiful. I bought it as a gift for my boyfriends parents who have their house decorated like a beautiful wine tasting room. I am so excited for them to open this for Christmas! It has heavy duty construction and weighs about 30lbs. The wood is stained a little darker than what is pictured but turned out better than expected. It was delivered within 2 weeks and was packaged very well. Be prepared to be home when they deliver it because it does require a signature. The smell is a little strong at first but goes away within a couple of days. This has been my best buy this year! When I took it out of the box, there was a small (1/4") sliver out of a "corner'. I needed the item and it was too bulky to return, so I just filled in the gap with some "color" and moved on. Great on my round dinner table! This was a 40th birthday gift for our best friend. It turned out beautifully and he loved it. The only reason I did not give it 5 stars was because of the strong odor from the wood stain. I hope that will eventually go away but it was over-powering fresh out of the box. Other than that I would highly recommend this product! This was a gift for my daughter and son-in-law, who have started their own Vineyard in Minnesota. They were thrilled with it, as it is of such great quality, beautifully made, and the first item received with their Vineyard name on it. This is a company that I have, and will keep ordering from. This is made very well and is of incredible quality. I purchased one for myself and one as a gift for a wine connoisseur. We were both impressed! It is important that you do not let the bottom section get wet when cleaning. It will rust and bind up and no amount of lubricant will cure it. Production and delivery with Monograming takes time so allow a good 6 weeks or more for delivery. I Had a Wine Rep from Schugs coming in to talk about his wines. I wanted to order 7 of the Lazy Susans before the date of the wine tasting, which was in 3 weeks. I spoke to Adam and he pulled some strings and guaranteed I would have them in time along with it being monogrammed with our logo. I actually received them in 2 weeks. They were packed securely and when I opened the boxes, the Lazy Susans were beautiful. They product was outstanding and of high quality. I can't wait to use them for my wine tasting and have already used them on a few receptions for displaying food. A++++ and thank you Adam for getting them here so quick. This was the biggest hit of the season! We bought a Personalized Raised Wine Barrel Lazy Susan for each of our adult children for Christmas. They were a hit with both households. We received quite a few compliments. costly. Shouldn't have waited - am thrilled with quality, craftsmanship, size and function. Am using it on kitchen island. Might get another one for the breakfast table!! This product is made very well - it is sturdy, spins smoothly and the ingraving is beautiful. I have a large square dining table and this really tops it off nicely. Would be great in a bar or kitchen as well. Looks great and made well. Everyone that's seen this lazy susan loved it and either wants one for themself or wants to purchase it as a gift. I bought this for my best friend and her new husband as a wedding gift. It is absolutely gorgeous and I cannot wait to get one for my husband and I. The bride loved it and immediately sent me a picture of it on display in her home. The packaging, delivery and everything perfect! I will be ordering more from wine enthusiast. The personalized wine barrel is wonderful. Well crafted and very functional. Thanks for the great job! I have given this to friends and brides as a shower or wedding gift (with glassware) and brought joy to many. This is very well made and special when personalized. I had a different brand that was not as well made, so I recently bought one for my husband. What he would call an "us gift"! Wonderful value for the money. It's as good as it looks in the brochure, top quality and very durable. Very happy to give as a gift. I ordered two personalized raised Wine Barrel Lazy Susan's for my daughters and son-in-laws for Christmas. They were so thrilled with them we were getting photos so fast it was unbelievable. We opened the first one and saw the quality and craftsmanship put into it and was so pleased we ordered one for the second daughter. I would tell anyone if you really want to give a gift that is tasteful and unmistakably beautiful to order a Wine Barrel Lazy Susan from Wine Enthusiasts. It is very reasonable cost wise and I could not be more proud of their response than I was. Sent one to my sister & brother in law for Christmas & they love it! Heavy duty & very durable! The best gift ever given to me by a friend and the best to give to friends. It lasts a long time. It is the gift that keeps on giving. This was a both highly functional and highly clever/aesthetic way to express our love and appreciation for my brother and his new wife. They loved it and now use it daily as it sits center stage in a large kitchen island seating area. The size, the look and the functionality of the lazy Susan are a perfect fit for the space. This thing weighs a ton, as it is made from solid wood and steel components. I expect it will last forever! Operates very smoothly and impressively. Engraving (burned into wood like a cattle brand) is a nice touch. Very happy with quality vs. the price which now seems very cheap comparatively. Ordered a few of these as corporate gifts. They said they could only capitalize the first letter of each line, we requested the first line to be all caps, and they did this for us. Order received very quickly, was one short, so they sent the last one to me express overnight. Will use them again. Love it! The color is perfect and the product quality is fantastic! I love my new wine barrel lazy susan. It looks great on my granite counter top in the kitchen and i use it every day. Perfect for every day use or entertaining guest with appetizers! I will use it inside in winter and outside in summer. It is very well made and very attractive. Highly recommend. Can you say amazing???? We love it! The attention to detail is stellar! The colors of the wine barrel online really don't do it justice, much better in actuality. i would and have recommended this to family and friends. You won't be disappointed! Also, it would be a great wedding gift! The stain used on the lazy susan had a heavy odor that lasted for 2 weeks. Became sickening at times. It's a conversation item, very attractive and useful. When we first unpacked it, however, it had an incredibly strong varnish/solvent smell. We had to air it out in the garage for a week. It was perfect except I couldn't figure out on your website how to add gift wrap or a note to the recipient. Just got it for my husband as a gift. He loves it and will use it often. Love the design and look. Great gift for someone else or yourself. We used the product on our dining room table and it look gorgeous with the table and chairs we bought. We also had it personalized to add that special touch and everyone loves it. Great deal on shipping and the product was packaged very securely. Bought this item as a gift...I opened it to see it before sending it and it was packed very well for such a large item (thank you!) so it was not damaged in shipping at all. The lazy susan was gorgeous and the personalization was very well done. I was VERY pleased and when it is opened as a gift on Christmas it will be a hit! Solid, great size. Personalization is engraved, not stamped. Exceeded my expectations! I loved this so much, I bought a bunch more for Christmas gifts. Works very well. Looks awesome, and the personalizing, really makes this a wonderful item to have. Bought this as a 40th wedding anniversary gift. My recipients loved it! I purchased this as a gift for my parents, their round table is large and makes passing food difficult during dinner. This is the perfect thing, they love it! It's plenty large enough, and looks beautiful. I LOVE this product. I have a round dining table and a fairly large family. I use it on my dining table to serve dinner. The rustic bottom gives it a sweet touch. Very happy and glad I didn't settle for a boring lazy suzy! I actually purchased two of these for gifts to close friends. I was pleasantly surprised by the warm reception the gifts received, both friends were very appreciative of the appearance and practicality of these items and that they fit in their lifestyle incredibly well. I will probably break down and buy one for myself. Very nice addition to the wine room! No more reaching for snacks and no more spilled wine! Just the right size. We bought ours as Christmas gifts and are very pleased with how they look and feel. Very sturdy and the wood finish is beautiful. Love the functionality of it!!! We received a personalized Lazy Susan as a gift from some friends and absolutely loved it. Had so many compliments on it, that it made it easy to know what to give as a gift to other friends that loved ours! No two are a like as the wood grains and colors in the woods from the wine stains as well, make them all the more beautiful and individual. The ordering was easy and it arrived sooner than expected which was perfect for the Birthday date we were aiming at. Just a great website with awesome items. Going to be ordering more fun items soon as we are building a wine room in our home. And we'll post pictures at that time. Couldn't be happier with wine enthusiasts!!! !